The Scalable Algorithms Department develops new algorithms and approaches to address challenges in next-generation computing hardware. The department uses its expertise in applied mathematics and computational science to address these challenges and help define the future of computing. We have four main research thrusts: performance portability, scalable solvers, scalable graph algorithms, and scalable machine learning. While mission driven and focused, the Scalable Algorithms Department performs most of its research in the public domain, which allows the R&D professionals in the department to publish in the open literature and effectively team with leaders at other labs, universities, and industry. The Scalable Algorithms Department is involved with the projects listed below. 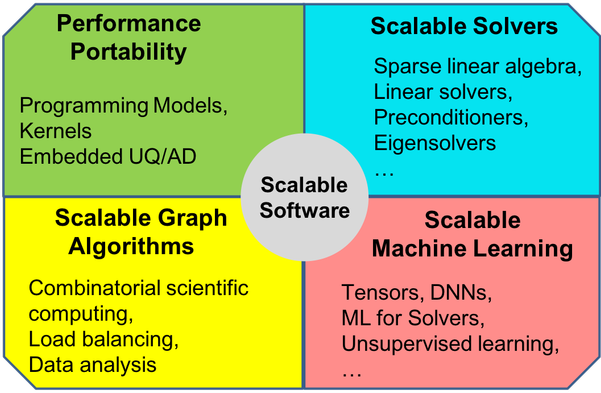 The Scalable Algorithms Department is involved with the software listed below. The Kokkos team is announcing the first Kokkos User Group Meeting to be held in Albuquerque New Mexico, USA April 23rd through 25th. The meeting will give the growing Kokkos community a chance to present progress in adopting Kokkos, exchange experiences, discuss challenges and help set priorities for the future roadmap of Kokkos. Projects are invited to give a 20 minute presentation. Application talks are encouraged to focus on technical and algorithmic challenges in adopting Kokkos and how Kokkos’s capabilities were used to overcome those.